My first watercolor in 25 years! I bought a watercolor set yesterday. One of my beloved friend/muse/patrons has pastel hair at present, and I feel like watercolor is really the medium with which to approach this phase of her beauty. I did maybe two watercolors in all of my art school career, and three after, and i haven’t touched them since. But seeing what Marc Taro Holmes is doing on CitizenSketcher.com has really inspired me, as has working with so many beautiful transparent colored materials in my mixed media work. Today I went to Neukölln to meet up with an amazing artist I met through one of my classes, Keir, then went to an Aktion Drawing Party to meet my artist friend Daria Rhein. 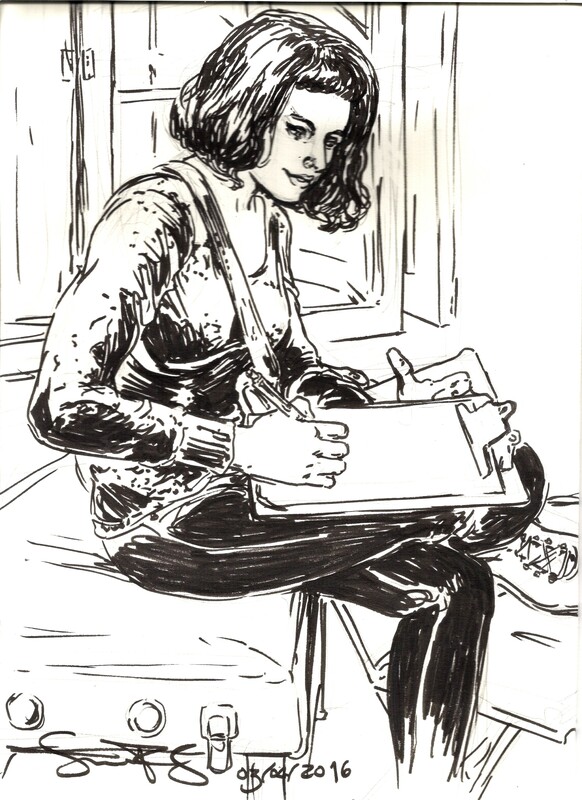 Here she is drawing at the event, which was at the Altes FInanzamt art collective. It was lovely, with a bunch of artists playing around with different materials, dogs and babies on hand, music of course, and two old-school projectors for live psychedelic wall art. As you can see above! The watercolors felt easy and comfortable to use until I abruptly relearned how important it is to have a lot of water to keep your brush clean and the colors from getting muddy. The cup of tea I was using wasn’t making it, so I switched back to ink to draw Daria. But it was a fun experiment well out of my comfort zone. On the way back I was so relaxed and loose I could see the big forms and shapes that make up a scene really clearly, and they seemed so beautiful to me. 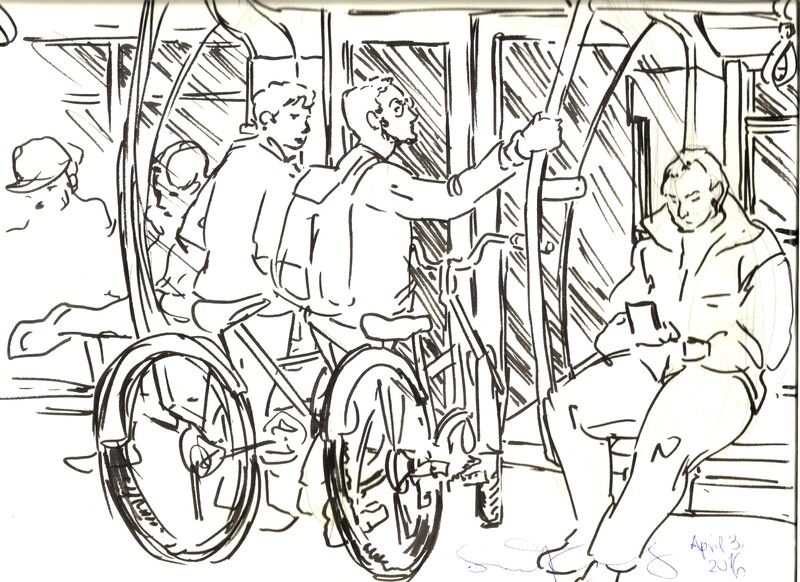 So I made this super-fast sketch of the people on the U-Bahn. It pleases me greatly although it’s quite obvious I don’t understand how bicycles work. Berlin is basically artist heaven. 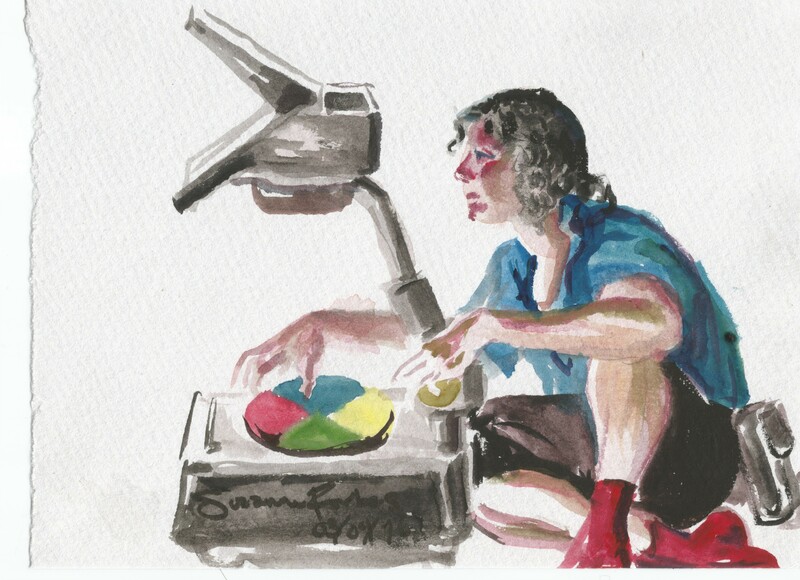 This entry was posted in Berlin, My art and tagged drawing in berlin, live drawing, portrait drawing, Suzanne Forbes art, Suzanne Forbes artist, watercolor portrait on April 3, 2016 by Suzanne Forbes.